Your resource for lighting information, tips, advice, definitions, and design. Lighting is an art and science. It can be subtle or make a strong statement. A space's light quality and lighting design can have a strong effect on the mood and ambiance. Here you can read articles on how to decorate and enhance your home, outdoor, or office with lighting tips and advice. We have articles on how to light based on different rooms or for special occasions. You can learn the difference of lighting fixtures and what their benefits are. Lamp and lighting history: A quick history of how lamps and lighting have evolved. How to Light Art: A guideline to help you light art work. How to Light a Bathroom: How to properly light your bathroom for grooming, washing, and retreat by identifying the right light bulb, light fixture, and placement. How to calculate lighting for a room: A neat formula for calculating how much light in watts needed to light up a room. Different kinds of light bulbs: An overview of different kinds of light bulbs and common uses. Incandescent light bulbs, halogen light bulbs, fluorescent light bulbs, led lights, xenon / hid. LED lamp lighting basics: A summary of what light emitting diode lamps (LED) are and its benefits. Track Rail Lighting: Overview of what track rail lighting is and different variations including monorail lighting, track lighting kits, low voltage and line voltage lighting. Create instant design using table lamps: Using table lamps as a quick and easy way to enhance your room's look and style. Outdoor Home Lighting Guide: A guide to help you properly light your home's outdoors. Includes how to light for energy efficiency and light pollution reduction. 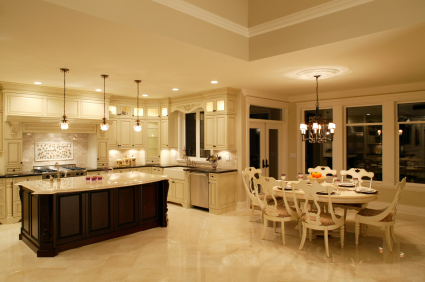 Four types of kitchen lighting: An overview of the four purposes for kitchen lighting: accent, ambience, task, and decor.